Foggy Friends has won many awards for it's layout and ease of navigation. This page contains these awards and descriptions of why they were awarded. "Congratulations from all the staff at Art Space 2000.com. You have won the "Gold Metal Web Award of Excellence" for originality, overall design and appearance, ease of navigation, and content. Keep up the good work." "Your website works very well. I am so happy and honored to send you this award for your website because it was a pleasure visiting your wonderful site." "Great site. This award is given to selfless lovers of humanity like you. Keep up the good work." "We enjoyed a very pleasant visit to your web site! It is with great pride that we announce that your web site is a WINNER of our esteemed Majon Web Select "SEAL OF EXCELLENCE AWARD." "We thank you for inviting us to visit your home on the Internet. We applaud your site's ease of navigation, obvious hard work, and unique content. It is with great pleasure that we give you the Webmaster Award." "PrimeSiteUK.Com is pleased to announce your site has been reviewed and have pleasure in awarding you our Gold Award. All websites submitted are judged on content, functionality, graphics and usefulness to the general public. We spend a lot of time reviewing sites and not all make the grade. You have done a great job, you deserve the award." "Congratulations!!! Your site, has been chosen as The Southern Nytes Award Winner this month. I enjoyed visiting your site and found it worthy of this award. It is evident that you have put a lot of hard work into building your site." "Great Site. It has been put together really well. I really enjoyed my visit." "Congratulations! Foggy Friends has been reviewed and chosen to bear the 2003-2004 Golden Web Award. You and Your Staff at Foggy Friends have Obviously Worked Very Hard. 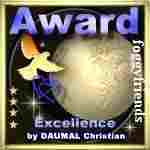 Proudly display your award."